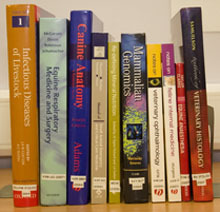 The Library has a range of electronic and print materials in all disciplines of veterinary medicine. Our print collection contains books, journals, conference proceedings and reports, including a large collection of annual veterinary publications from commonwealth countries. Our Historical Collection contains approximately 3,000 books tracing the development of veterinary art and science from 1514. Our focus is on providing off-site electronic access to material which is made available to library members. Click here for our list of electronic resources. Search our catalogue for our print journals, books, and reports.